Achieve salon-worthy results with the DS Laboratories Nia Conditioner; an advanced restructuring formula developed to repair, hydrate and protect chemically-treated hair. Infused with a cocktail of beneficial ingredients, including Ginseng, Panthenol and Wheat and Soy Proteins, the lightweight conditioner effectively moisturises and detangles hair for a sleek, smooth finish. 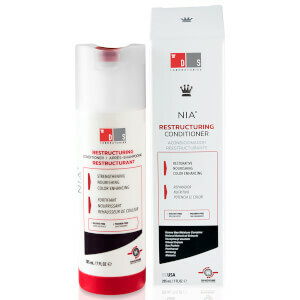 Helps to combat breakage and split ends, whilst enhancing colour vibrancy and promoting silky soft locks from root to tip. Massage into hair after shampooing. Rinse.